Having invented ‘northern jazz’ and essayed his hand at a Lucifer-themed breakbeat album, David Hanke – a.k.a. 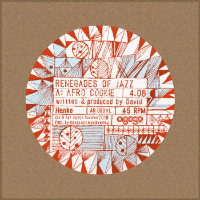 Renegades Of Jazz has of late turned from the dark side to the dark continent (inspired by an early childhood spent in Tanzania) and cooked up a whole afro-funk LP Moyo Wangu. The first course from the new ROJ kitchen is Afro Cookie which offers Fela-esque rhythms and horns. Over on the flip traditional work chant The Pounding Song gets a breakbeat makeover because you can never underestimate the motivational potential of a good beat. And that washing-up was never going to do itself now, was it?